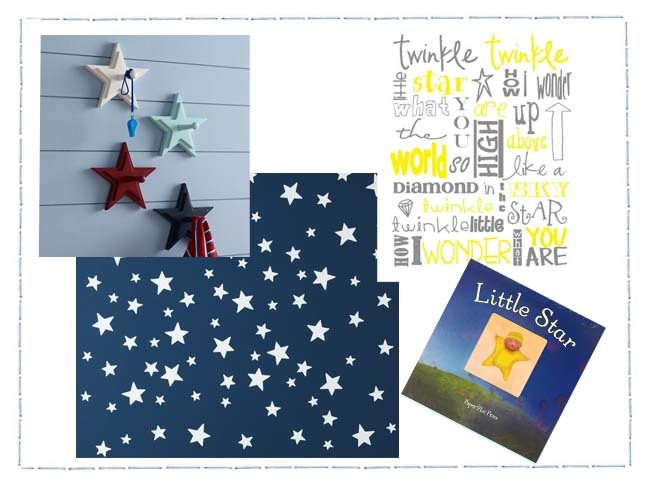 The Twinkle Twinkle Little Star nursery rhyme is so well known and a childhood favorite for all… So why not make it part of your every day life by creating a star-themed nursery? These essential pieces will help you build the nursery of your dreams but allow you to evolve and change the room as your child grows. The Sleight Crib at Pottery Barn Kids (sale $599) brings soft lines and a timeless feel to your star-themed nursery and later converts to a toddler bed. 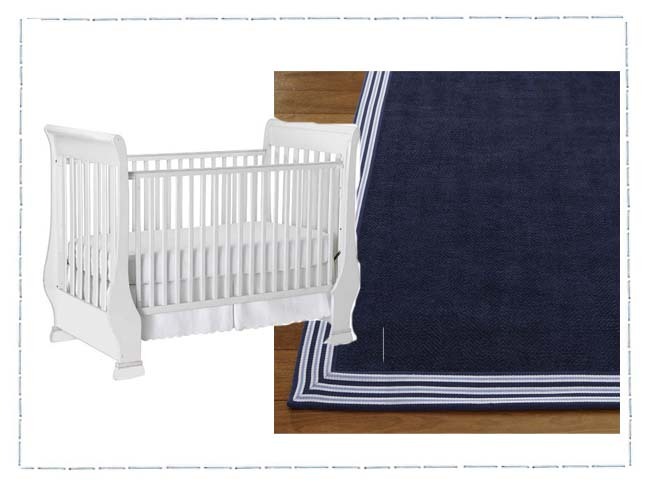 The Border Chenille Rug ($69 – $269) at Pottery Barn Kids comes in pink and navy and is a perfect yet simple addition to your child’s nursery. This super soft rug will last you many years. Go with simple pieces for the furniture, glider and rug, then splurge on the star accents! 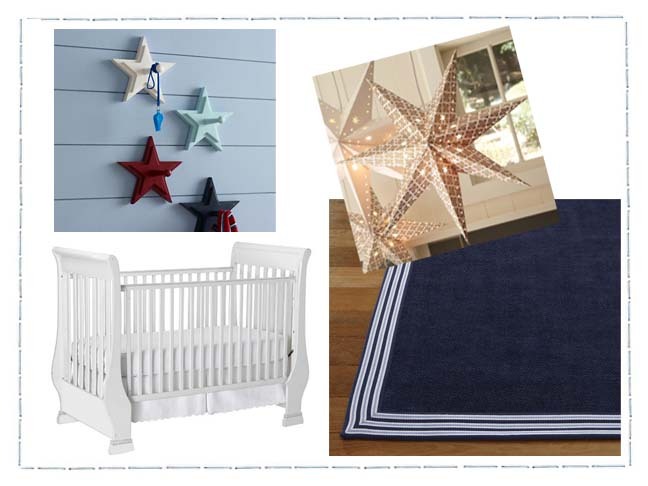 Instead of a mobile, hang the Pottery Barn Gold Star Pendant ($19) – or a cluster of them – in the corner of the room just above the rocking chair to add a soft reading light and a beautiful focal point for your baby. The Tiburon Glider ($999 – $1149) is the perfect addition to your nursery and your home. The soft lines mimic and compliment the crib’s design without being overly matchy. This glider can easily be dressed up with a homemade star pillow or monogramed throw blanket. 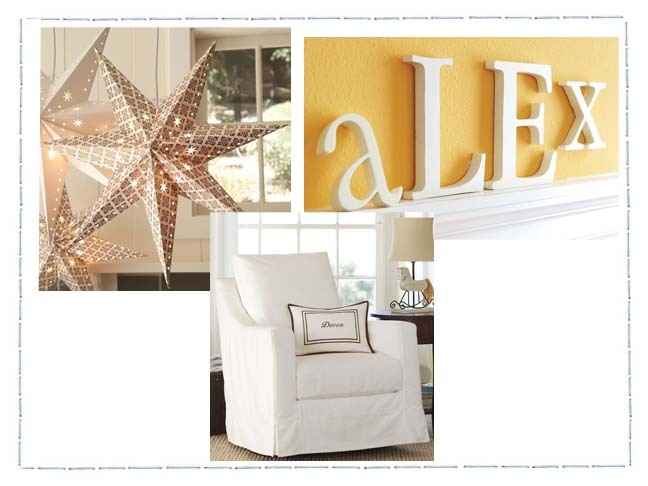 Spell out “WISH” or “STAR” or even your child’s name with the large White Capital Letters ($10 each) to decorate the wall above your child’s bed or on a neighboring wall. Just make sure to secure the letters properly if you’re placing them above a bed for safety reasons. Hang your baby’s first coat or newborn cap in a safe, clean and easy to reach place — next to the changing table or nursery door — with these Wooden Star Wall Pegs ($12.95 each). Frame a modern looking version of the classic song on your nursery walls with the Nursery Subway Art on Etsy ($8). This print allows you to customize the color of your frame and mat. Decorate your baby’s ceiling with Glow-in-the-Dark Star Decals ($24) to bring a soft light to the wee hours of the morning and to add some fun to the décor of the room. And finally, finish off your nursery with a personalized Little Star book ($49) to read with your baby every night before bed.